Barton Rovers striker Keshi Anderson scored a six minute hat-trick for Championship side Brentford’s Development squad as they beat Crystal Palace in an U21 Professional Development League Two South match on Tuesday. Anderson, who replaced winger Sam Saunders just after the hour mark, notched his treble in the 83rd, 88th and 89th minute as the Bees triumphed over their Premier League opponents. 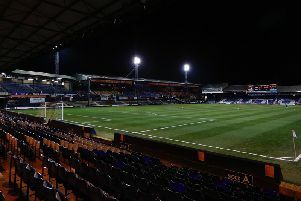 The forward recently been training with Luton Town after netting 16 goals for Rovers in Southern League Division One Central this campaign, while Barton have also turned down a bid from Cambridge United for his services. Hatters boss John Still said: “He falls into that category of people that we’ve looked at, but everything we’re doing at the moment is on now. Against Palace, it looked like the game would end 0-0 until Nico Yennaris fed Anderson who smashed a right-footed shot that flew in off the underside of the bar. With time running out, the Rovers frontman had his second, volleying in with his left foot, before completing the perfect treble, as he got in front of former Luton loan man Ryan Innis to head home. Anderson also scored for Barton in their 4-0 victory at AFC Hayes on Saturday.